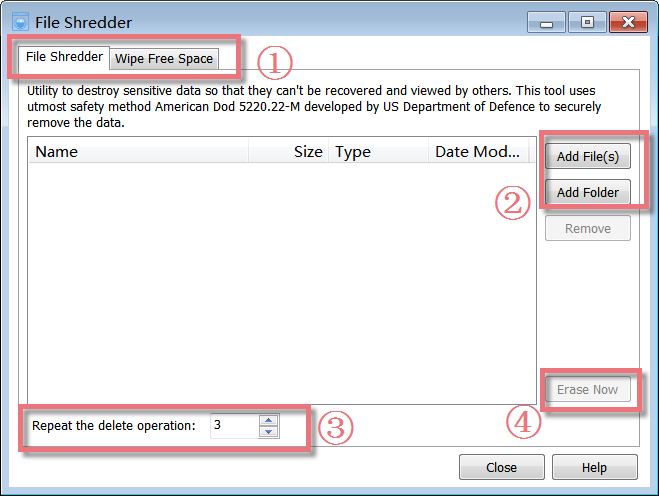 File Shredder is a powerful program that keeps the Privacy and Security of your system intact. It deletes the data in such a manner so that no tool can recover it. It uses utmost safety method American DoD 5220.22-M developed by US Department of Defense to securely remove the data. 1. 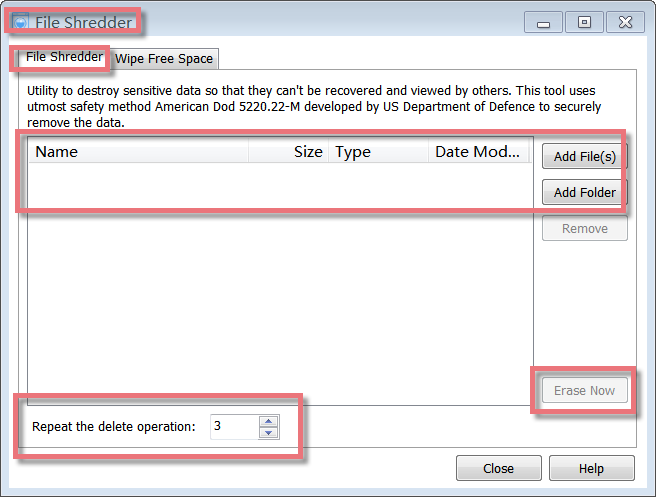 The First Line Buttons: quick access button to "File Shredder" or "Wipe Free Space" function. 2. The Upper Box: allows you to add files or folder that you want to shred. 3. The Lower Field: allows you to schedule the number of times the files marked to delete, and this is set to 3 by default. 4. "Erase Now" Button: After adding the files and folders to the delete-list, click 'Erase Now' to permanently delete them. You can specify the number of times the files marked to delete are over-written with junk data before deletion. The range of passes is from 1 to 10. By default, this is set to 3. The security of the deletion can be increased further by increasing the number of repetitions, but the time required will also increase. When you delete a file in Windows, it will probably be moved to the Recycle Bin. Anybody can get a file back out of the Recycle Bin. For this reason, many users empty the Recycle Bin regularly, or delete their files without moving them to the Recycle Bin. But you should know that Windows does not really destroy a file when it deletes it, its entire contents are still located on the hard drive. Windows simply marks the file as "deleted" in the file system, and the disk space occupied by the file can be used to store other data. But as long as nothing is saved in the area occupied by the deleted file, this "lost" file can be found and recovered easily through inexpensive and easily available data recovery utilities. These tools makes your data unsafe as any unauthorized person can recover the deleted data and use it. Here File Shredder can help you solve this issue. To start the tool, click 'File Shredder' from Glary Utilities main window. Click the 'Add File(s)' button to find and insert the files from your hard drive. You can also add folders by clicking the 'Add Folder' button. After adding the files and folders to the delete-list, click 'Erase Now' to permanently delete them. When you delete or empty a file, Windows removes the reference to that file, but doesn't remove the actual data that made up the file from your hard disk. Over time, this data will be overwritten as Windows writes new files to that area of the disk. However, the files can be easily recovered by data recovery software. Given the right recovery program, someone could reconstruct all, or parts of files that you've deleted. For privacy and security reasons, you can set to wipe the free areas of your hard drive so that deleted files can never be recovered. Please Note: Wipe free space can take a substantial amount of time. To start the tool, click 'Wipe free space' on Advanced Tools page from Glary Utilities. Select the drive you want to wipe the free space. 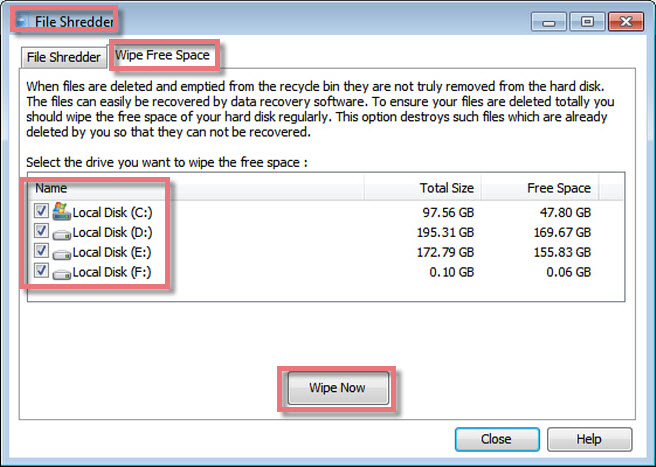 After marking the drives, click 'Wipe Now' to permanently delete them. Click "Shred files" or "Wipe free space" under Privacy, File Shredder will pop up. Find and click File Shredder icon, File Shredder will appear. Please note: if you want to add File Shredder in the Dock bar, click in Dock bar, remove any icon by dragging it out of the Dock firstly, and then drag File Shredder in.